The Accella Endzone Sit to Stand with Hand Crank Adjustment ergonomic computer workstation features three distinct zones to accommodate your needs throughout the workday. Your workspace can be configured in a variety of ways-the Accella End Zone offers flexible options for placement of your monitor, telephone and supplies. It even offers comfortable space for a visitor to pull up a chair. The worksurface smoothly raises and lowers the worksurface with your choice of hand-crank or powered height adjustment. 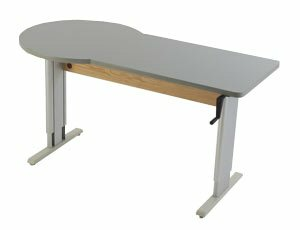 A 27-39 inch height adjustment range lets you choose a comfortable and productive task height for seated or standing work. Sturdy metal legs are graphite silver. Two Year Warranty.